If you work for a charity then chances are that you are familiar with the concept of a Volunteer Executive Board. Often this concerns a group of men and women (sadly the former are usually rather over-represented) who have at one time or other agreed to be a member and who may have a range of - sometimes strong, sometimes tenuous - affiliations to your organisation. They are often, but not exclusively, people with a background in business or a high-profile role in the community and if you are lucky they have a decent network. 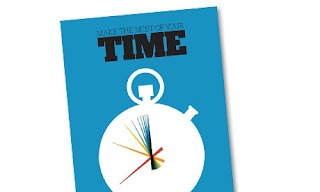 Although in principle they are a well-willing bunch of people, it is worth putting some thought into how to use their goodwill and often limited time most effectively for your organisation's fundraising goals. Without a strategy for proper engagement, you run the risk of your board being at best a high-level think tank and at worst a disruptive force within the organisation. 1. Engage them. Even though you might expect your Board members to be 'on board' with regard to the work of your organisation, it won't hurt to remind them what your organisation is all about. Share your vision and your enthusiasm. Share success stories. Make them 'get' it. 2. Brief them. Give them big picture updates on your organisation's fundraising goals, what you are doing to achieve them, how successful you are and what challenges you need to overcome. If they are expected to host or attend events, then brief them as you would brief your Chief Executive or senior staff. In order to be effective advocates for your organisation they need to know the big stuff (what your organisation's 5-year fundraising priorities are) and the detail (the job and interests of the person they are sitting next to at a cultivation dinner). 3. Give them a job. Choose something that suits their skills, interests, network and resources. 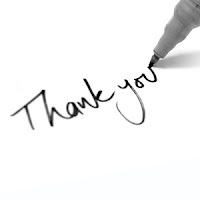 Some Board members love to host events - think fundraising dinners, thank-you receptions - in their homes or offices. Others can use their network to make connections with individuals or trusts you are approaching for funding. Some may be able to make sizeable donations themselves. 4. Catch up with them - and not just at the annual Board Meeting. Have regular opportunities for feedback and make sure that they remember to do what they committed themselves to doing. 5. Thank them. Remember they are giving up their free time to help your organisation. Are you getting the best out of your Board? My pre-school daughter likes issuing orders. "I want FIVE stories tonight," she announced at bed time last week. 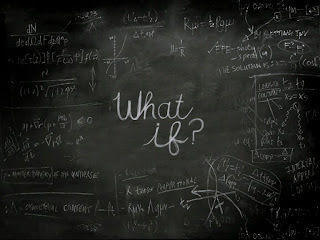 Like Pavlov's dogs I react instantly, "I want doesn't get." "I remember," says she. "The day when you said I want sometimes gets." Silently, I curse that weak moment but recovering quickly I meet her steely gaze. "Well, I want does sometimes get. But only when the thing that 'I' wants is the same as the other person wants to give." Ignore the grammar, okay? It's true. And there's a lesson in that. One mistake some major gifts fundraisers make is in thinking they are selling. For some, there's a fear of face to face asks which seems to run marrow deep. A belief that you have to know your pitch word perfectly, to have a perfectly packaged case for support in glossy brochure full of images of smiling children. I have been a major gifts fundraiser for nearly ten years and in that time I've raised a fair amount of money. I've asked trusts for money. I've asked companies for money. And more than anything I've asked people for money. How many times do you think I've been asked for my elevator pitch? Because, as Mr Ken Burnett pointed out many a moon ago, fundraising is about relationship building. It's about having a coffee with someone and having a chat. It's about finding out what they care about in the world and asking them what they would like to change or have an impact on. It's about discovering what keeps them awake at night and what they want for their children's future. It's asking them what they love about the charities they support and what they wish was done differently. And then it's about discussing whether your organisation can help them to do that. In a really good meeting, you give something of yourself away. It's not a one way stream of selling and it's not a one way stream of listening. It's a two way exchange where you build a rapport, share what excites you both and discover common ground. And in the best of all possible worlds you find out that what you want, what your organisation needs is also what your potential donor wants to give. But what you don't do is walk into a room saying, "We want." Because that just doesn't get. It is with great pleasure that I introduce today's guest poster, none other than Adrian Salmon. Adrian has been the Footsteps Fund Manager at the University of Leeds since 2008 having previously been Head of Client Services for The Phone Room in Oxford. Recently he headed to the the Institute of Fundraising's National Convention, and agreed to report back for the Fundraising Collective on what's going on charity-wide. Thanks Adrian, and welcome to the blog. Recently I spent 3 days at the Institute of Fundraising’s National Convention, to find out what’s going on in the big bad world of the wider charity sector. It’s funny, but when I come back to the office from conferences, I always feel like Cosmo Kramer in Seinfeld, sliding in with a ‘Hey!’ to tell Jerry, Elaine and George his latest crackpot scheme. So, is there anything good to tell? Or is it more the equivalent of Kramer’s most glorious pointless scheme – “The Coffee Table Book of Coffee Table Books”? (As a reward to you for reading, there’s a link to Kramer’s best entrances at the end). But now – what a change. Digital’s everywhere. Everyone’s crazy about it. And three things stood out for me that summed up the whole event. The first was the debate – between ‘old-style’ (and hugely successful) direct marketer Stephen Pidgeon, and ‘guerilla blogger’ A J Leon. The proposition? “This house believes that online will entirely replace print as the main medium for acquisition and retention in the next 5 years”. A bold statement indeed, considering that, as Stephen pointed out, giving via online sources still represents only 8% of the total donated to charity in the UK. And even if it grows by 20% year on year for the next 5 years, it will only then be at 13%. But although AJ won the day – partly because the motion got changed – my head’s with Stephen. Online’s got a long way to go yet, folks. Which leads me onto the second thing that’s shaped my view of the three days – the award for ‘Best Use of E-Media’ at the National Awards on Monday night. If digital’s where it’s at, this is the best of the best, right? Hmm. The winner was UNICEF’s ‘Own a Colour’ campaign. “Own A Colour And Help Save A Child’s Life”. You may have seen it, there’s been a lot about it on Twitter. And it’s a very simple proposition – buy one of Dulux’s 1.67 million colours on the website (which is indeed a fabulous technical feat) for £1 or more, and support UNICEF. The target was to sell all the colours, and raise £1.67m. Nice. So – how has it done? There’s a counter on the website. Since November 2011, this award-winning campaign has raised…. Compare that to one of the other entries, Care International’s Kiva-inspired Lend With Care, that has just broken the £1m mark in loans, since launch last March. Or Wateraid’s The Big Dig, that has raised over £600,000 since June 18th. And, in the way that that campaign has empowered field workers to blog from the front-line, I think there are lots of takeaways for all of us who work in higher education fundraising. Now, I’d really hate you to think I’m dissing the huge amount of work that the folk at UNICEF have put into Own A Colour. You can see that they have. And if an online campaign I ran had raised over £100K, I’d be delighted. But UNICEF? If I were in their shoes I’d be a little disappointed, and wondering what we could do to turn this round. It perturbs me that this could now be seen as a model to emulate, and I may write another blog about it. Let me know if you’d like to hear more. So, I’m a right grouch and a know-it-all, aren’t I? Didn’t I like anything, I hear you ask? Well yes, I did. The session that made me go, ‘Wow’ was about mobile. And SMS. And UNICEF, again, but doing something way, way better. UNICEF have been using SMS on the street as an alternative to the monthly direct debit sign-up, as a way to improve their subsequent donor retention. It’s so much easier to give a gift by text to a street fundraiser, and, by offering street-recruited donors a choice of amounts - £3, £5 and £10 – to donate by text, they can see who’s most likely to convert to Direct Debit. They phone them up afterwards to secure the monthly gift, and get around 1 in 8 people going onto Direct Debit. That’s pretty nice already. But then here comes the genius bit. Lots of their donors were saying, “Why can’t I give my monthly gift by text as well?” And of course they can, but every monthly text would have to come, by law, with the option to ‘STOP’ in the message. Not so good for retention. So UNICEF went to the regulator and said, “We’re a charity, not a ring-tone merchant. Can we change this message to ‘SKIP’, instead?” And the regulator said, OK. So, a regulatory requirement becomes a donor-centred benefit. Can’t manage your £5 this month? Skip until the next. You can’t do this with a Direct Debit. It’s the Milky Way of charity donations – the gift you can make between jobs, without hurting your bank balance. They phoned back all the people who’d refused a monthly gift by Direct Debit, and got another 1 in 8 people going onto a gift by monthly SMS. Wow. I’m wondering if I can adapt and copy this, off-street. Are you, too? So, #iofnc 2012. There you have it. The future’s bright. The future’s digital. The future’s traditional. The future’s mobile? Thanks for sticking with me, and – here’s Kramer! Involving spouses or partners is a powerful tool when it comes to both cultivating prospects and stewardship of your donors. Major gifts are almost always joint decisions, so pay attention to and acknowledge the spouse or partner. One of my recent major gifts was from the spouse of a well known philanthropist. They spoke very openly to me, how their spouse was perpetually the one to be ‘asked’ for donations. They spoke of how they themselves are now a retired professional and had a trust fund of their own to distribute as they saw fit. They continued on to tell me how their spouse regularly gave to their alma mater but it wasn't until the institution involved, cultivated and asked both of them that they gave a seven figure gift. Never underestimate the power of cultivating the spouse or partner. Organise events and occasions that include them and get to know their interests, hobbies, what non-profits they support, etc. Ensure their names are included in any lists and listen to what they say, ask them for advice and involve them in the decision making. How do you involve spouses at your non-profit organisation? French poet and politician, Alphonse de Lamartine, wrote these words in 1831 to describe the emergence of the daily newspaper. Anyone would think that these words describe the present online media environment with its feeds, streams, texts and tweets. We live in a world where we have everything at our finger-tips. We want information and we’re not willing to wait for it. Sometimes when we're in our fundraising bubble, we want gifts in, targets met, memorandums of understanding signed but we have to keep our donors' needs in the forefront of our minds. By asking for a gift over a certain period of time, one reduces the ‘pain’ of the gift and this is particularly important in the current environment. Normal pledge periods are three to five years and many donors end up paying them off early. I always ask them to sign a pledge form which is of course non-binding legally but it helps make the process more formal and it's always good to sign on the dotted line. A pledge allows the donor a way out should exceptional circumstances prevent him or her from honouring the pledge. In the 10 years that I've been working in fundraising there have been very few pledges that have not been paid in full. It also helps with donor stewardship and rememeber every gift a donor makes to your organisation is a down-payment on the next, so get thanking! I do a lot of work with scientists. As I may have mentioned before, scientists are creative rebels. They cross boundaries, push back frontiers. 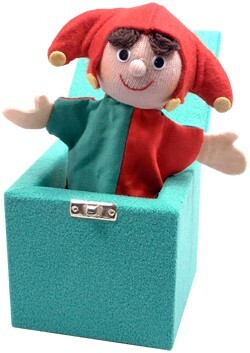 They don't like to stay in their box. I'm lucky enough to work at an organisation that champions academic interdisciplinarity. It's a culture of innovation and cross-fertilisation. From Biologists working with Engineers to Informaticians working with Artists, it's clear to me that new thinking tends to happen at the fringes of the disciplines. Ideas collide, leaps are made. It's exciting, it's important and it's something we fundraisers can take a lesson from. How often do you as a fundraiser work with people from other disciplines? Not just academics or activists but people doing similar sorts of work in different ways? How often do you network with entrepreneurs and people in business and talk about the way you do business? How often do you collaborate with people from outside your department to see if you can discover new ways of working, improve your practices and innovate? Higher education fundraising in the UK has a wonderful culture of information sharing. Fundraising peers freely disseminate best practice, exchange ideas and network. But, as a sector, we can be quite inward looking. Innovation happens at the fringes. It happens by pushing about the boundaries of what we do, interacting with people outside of our usual channels and asking "What if?" It's not just academics who can cross-fertilise ideas. Try working with your International Office. Or your Commercial colleagues. Explore what each of you brings to the table to further your organisation's mission. Talk about where you overlap. Discuss where you can help each other to grow, change and transform. You may well find that if you work together you can create and seize opportunities you never knew existed. In part 1 of my introduction to predictive scoring models I wrote about how some data variables have particular ‘predictive power’. This is based on the correlation they have with the thing we want to predict, the dependent variable. In my example I attempted to find variables that would predict likelihood of making a gift so I compiled a list of those data variables that appeared to have the strongest correlation with being an existing donor. The next stage of the process is to tie this together. You need to produce a report from your database for each constituent in your sample with columns for each of your data variables. Ask questions of your data that require answers of YES or NO. Code the results as 1 for YES and 0 for NO. The first binary column in the table represents the dependent variable. Has this constituent done the thing you are trying to predict? If you have the skills and the tools to produce this yourself, great, if not, you need to cultivate your relationship with your database team. The next thing to do is add up the 1s and 0s for all the independent variables you have included in your file to produce a score for each row/person. It doesn’t matter how many variables you have included in your model. Don’t include the dependent variable in your score calculation. The thing we want to determine is if the score has a relationship with the number of donors found. Saving the output columns in numbers allows you to multiply and group the results by score easily. It is not easy to see from this whether or not the model has produced anything useful. 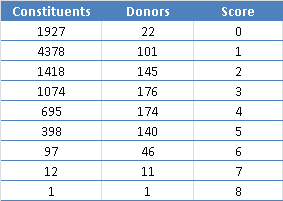 What I need to do is show what percentage of each score is a donor as there are vastly different numbers of constituents at each score. I also find it best to show the effectiveness of a score by plotting it into a graph. 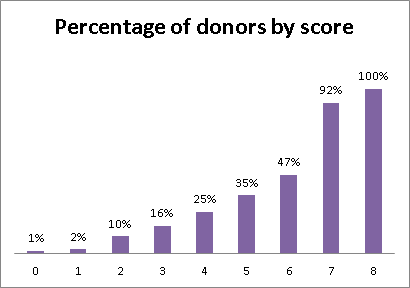 This shows quite clearly that the higher the score the higher the percentage of donors found. The problem here is that there are very few constituents at the higher levels. Only one constituent scored 8 points and they happened to be a donor. Not much good for segmentation. It is important to look at results of your model based on percentiles of your sample. What does the top 25% of constituents look like when compared to the bottom 25%? 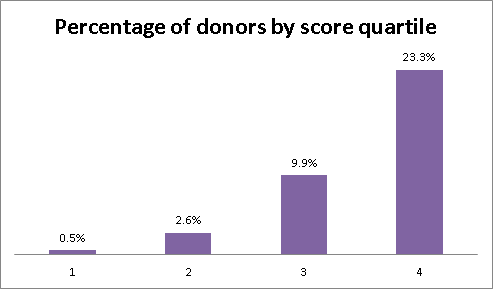 So looking at the fourth quartile, 23.3% are donors or 551 donors from a possible 2366. What we have done is identify a large group of people that are not donors but look like our donors. We also have identified a large enough group to start segmenting our data for calling or mailing.